We have half-a-dozen different varieties of pear trees in our kitchen garden orchard. Red Clapps and Ubileen are early season pears good for eating soon after picking. Comice, Conference and Highland are late season storage pears, creamy and full of pear flavor by Thanksgiving and Christmas. And mid-season there’s Orcas. If I could have only one pear tree, it would be Orcas. We actually have two. What good fortune that horticulturist Long noticed this tree. Perhaps he was drawn to it because the pears are so beautiful. Or maybe he took some pears home and let them ripen and found how delicious they were, juicy with a mild pear flavor. Perhaps he watched the tree over several years and saw how vigorous and productive it was. All of these qualities are true of the descendants that grow in our garden and I’m grateful that Long shared his discovery with other orchardists and nurseries. Each year since they started producing, our Orcas pear trees have set a heavy crop that’s ready to pick by mid-to-late September. Scott thins out about half of the pears in June, leaving a tree that’s still loaded with fruit. Over the years, yields have ranged from sixty to one hundred pounds. This year Scott picked them on September twentieth, filling three boxes with sixty-six pounds of fruit. Deciding when a pear is ready to pick is challenging. We rely for guidance on a tattered page saved many years ago from Sunset magazine. There’s a harvest calendar based on Mt. 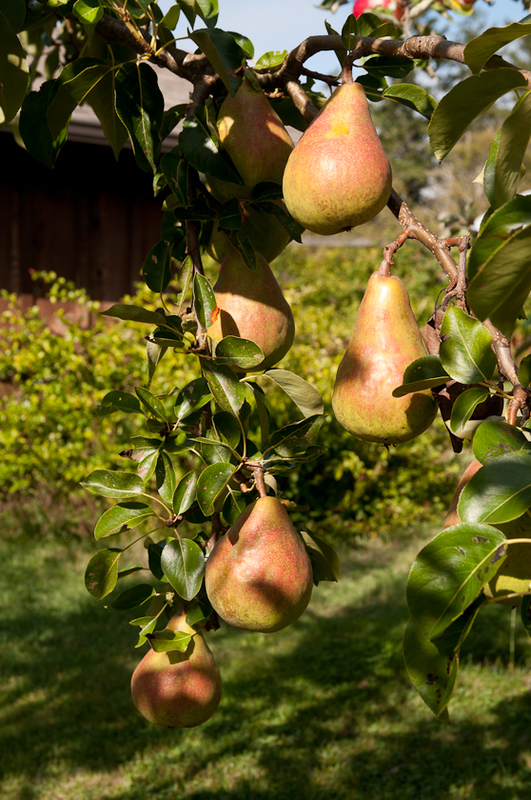 Vernon, Washington research, but the writer adds this useful advice: “You can double-check the harvest dates by seeing how easily your pears come off the stem. Lift them and tug. If you have to twist and pull hard, as if breaking a green twig by hand, you’re too early. If the pears snap off cleanly, they’re probably ready to harvest. If they’ve begun to drop and you haven’t started picking, you’re probably on the last side.” Scott starts checking early for that clean snap. The pears are still hard but that’s because like most pears, Orcas pears ripen off the tree. We put them in a cool, dark room and in a week or two they start to ripen, but not all at once, fortunately. They are ripe when they turn yellow and the area at the stem yields to light pressure. 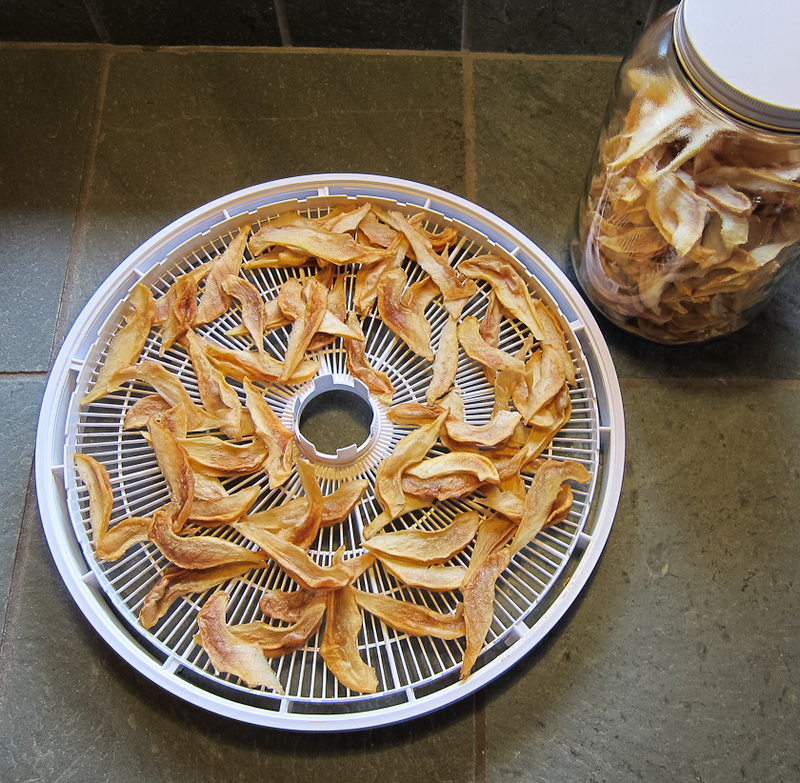 I check on them daily and find a couple dozen ripe pears each day, just the right amount to peel, slice and put in the dehydrator to dry. We enjoy them fresh, too, but drying has become our favorite way of preserving the flavor of these lovely pears. 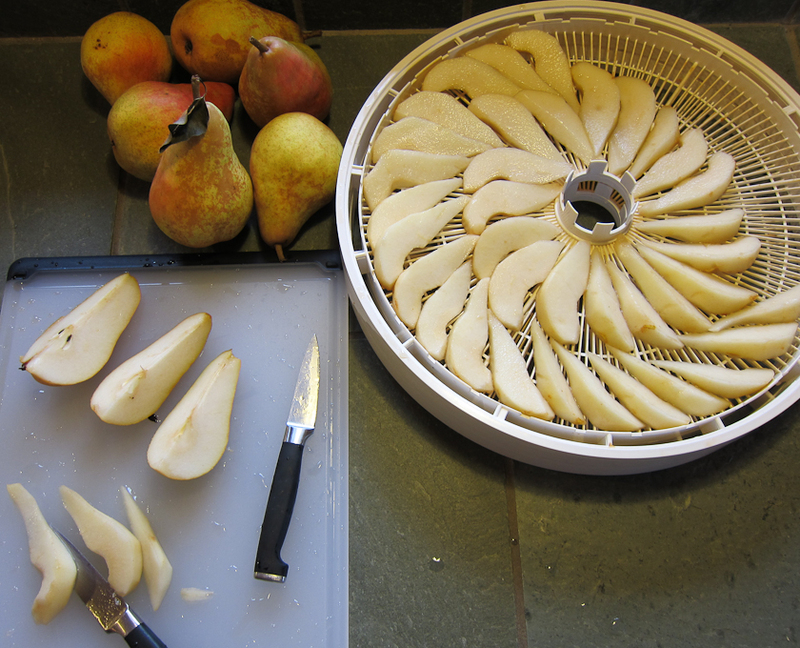 To dry them, I cut each pear in quarters, remove the core from each quarter, peel off the skin, and then slice each quarter into thirds or fourths and lay the slices on the dehydrator tray. (I have a NESCO Gardenmaster food dehydrator model FD 1010 that takes up to thirty stacking trays; I have eight trays.) They dry in about eight hours and are ready when they are still supple but no longer moist. Each dry slice is full of concentrated pear flavor. I store them in gallon jars and use them throughout the winter for snacks. Scott also cuts up a cup or so to add to each batch of granola. And along with apples which I’ll dry later, they make a Christmas gift my family looks forward to. Drying pears is labor-intensive but only for about an hour or so a day for a week or two. And there’s a pleasant rhythm to the task. Pick up a pear and admire its shape, each one a variation on the classic pear shape, some more elongated, some squatter, some a touch asymmetrical. Notice the color. The skins of ripe Orcas pears all have a warm yellow undertone with a very light stippling of green and brown but differ one from the next in the amount of red/orange blush. Decide where to cut and move through the steps of coring, peeling, slicing, arranging and then move on to the next pear. Each task takes some attention but the mind can also wander. I think of fall as a time for this kind of work. Shelling beans is another task that takes a little attention but leaves most of the mind free to contemplate the beauty of the fruit or vegetable, perhaps take in the view from where you’re sitting or standing and enjoy the end of the busy summer season while anticipating the quieter days of fall. This entry was posted in Fruit and tagged drying pears, Orcas pears, when to harvest pears by Lopez Island Kitchen Gardens. Bookmark the permalink. Sheer poetry, Debby — it must be close to heavenly to walk into the dark, cool room where these lovelies are ripening and take a big sniff! Thank you for yet another feast for the eyes and the imagination! You’ve written about the Flavor of Tuscany so I went to Islehaven and ordered a copy of it and I got in 5 five days. I’ve been reading it since. It’s a great book for recipes! Thanks! I’ve been thinking of getting an Orcas pear and now I’m sold after this blog. Lovely, lovely! I can almost smell those pears. Now I’ve got to find a bare-root Orca to plant this winter. I check back to this post every year to remember when the Orcas Pears on my tree should be picked. Has the warm weather from this summer changed your harvest date? I noticed one pear on the ground this morning 9/6/15. Do you pick all of your pears at once or just the ones that twist off easily? Nice blog, I’ll have to come bike Lopez! We picked our Orcas pears last week! Very early and due no doubt to our unusually hot summer. We usually pick them all at once though we do leave those that don’t lift off easily. The trick is getting back to them before they drop! Now the boxes of pears are in a cool closet and I’m checking them daily for ripeness. I think in another few days it will be time to start drying them. Thanks! I’ll get out there this afternoon!